How do you look back to look forward? Read an old journal, scroll through old photos, buy one of those cheesy posters? For the team at Gainsight, one of the leaders in customer success software, the answer involved Ross, Rachel, Nirvana and Britney Spears. 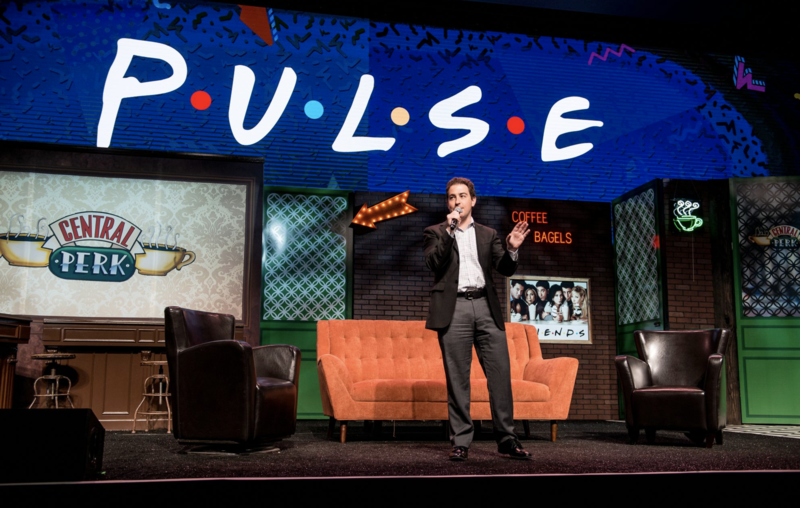 Their fifth annual Pulse conference was a ’90s bash through and through. Nostalgic music videos, sitcom set recreations… even a performance from none other than Vanilla Ice. Yes — that Vanilla Ice. As a former content strategist, I pondered the strategy and execution for this shindig. 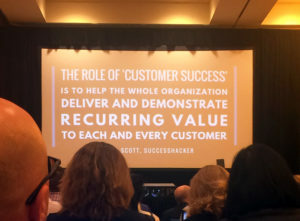 After a full week of attendance and conversations with the Gainsight team, including the Head of Content, Matthew Klassen, I learned how important content was for the success of the conference. The planning committee of Pulse consisted of a cross-functional team led by the VP of Marketing, Anthony Kennada. It was composed of Gainsight employees from marketing, the C-suite, customer outcomes, sales and others. Once the committee decided on big goals and themes (e.g., the ’90s theme), three departments essentially owned the event: demand gen, brand and events (all under the umbrella of marketing). There was a lot of content to get out: emails, blogs, ads, landing page copy, promo videos, app notifications, etc. The conference used DoubleDutch, a tool for building event apps. This app had to include logistical info for registration and evening events. A special touch was the Official Pulse Playlist, which included dozens of hits from the days of ‘TRL’ (‘Total Request Live’). One notable piece of content was a YouTube video jam-packed with ’90s references posted two months before the conference. The Gainsight team managed to weave the ’90s and customer success theme into off-site promotion as well. Head of Brand, Will Chamberlain, published a BuzzFeed community article just days before the conference, 12 Clues That Prove Chandler Bing Was The First Customer Success Manager. I was curious to see just how ’90s things would get once inside. Each room relived a famous ’90s TV show. Central Perk – The orange couch of the ‘Friends’ coffeeshop was the main stage decor. Wayne’s Basement – It was fun to see Shiv Mahajan and Nora Soza of Box present some technical automation tactics in front of the raggedy couches of ‘Wayne’s World’ fame. Wilson’s Fence – A simple but memorable wood fence brought back ‘Home Improvement’. R.I.P. Earl Hindman, who played Wilson and passed away in 2003. Blanche’s Lanai – I didn’t know what this room was until Googling it. Perhaps I was suppressing the fact that I watched ‘Golden Girls’ as a kid. Uncle Phil’s – The Fresh Prince’s throne was a welcome sight. Jerry’s Apartment – The “Kramer entrance” earned several mentions throughout the conference. Tanner House – ‘Full House’ was great in the ’90s, if only it would stay there. The Winslow’s – Urkel and company rounded out the stages. TVs were set up throughout the conference floor and played a hybrid of music videos and classic TV shows like ‘Street Sharks’ and ‘Doug’. One phone call with my director was interrupted as he laughed to Whitney Houston singing in the background. The overall design involved bright oranges, blues, and pinks with zig-zags and squiggles a la vintage Nickelodeon. It didn’t stop at inanimate decor. All the volunteers wore ‘Beverly Hills 90210’-inspired T-shirts. As the the ‘Friends’ theme song died down, impersonators took the stage and performed a customer success themed skit. The script was actually written by Serra Hetzel, a regional sales director at Gainsight. The next day was kicked off by a Vanilla Ice performance of “Ice Ice Baby”. Cheers erupted when he referenced the once king of video, Blockbuster. Themes and consistent messaging are great, but what if it doesn’t deliver? It’s hard to quantify the effect of a retro theme. Kennada and Gainsight had to go with instinct over analytics as they championed the ’90s theme, and it was well received. The hosts did have the opportunity to directly promote content as well. Gainsight CEO, Nick Mehta, was directly promoting their blog content and relevant external content in the opening keynote. There was no direct link to access the posts, but I got some insight from Klassen on metrics. We see an uptick in almost all our traffic analytics ramping up towards Pulse. That curve levels out during the event, drops precipitously over the weekend, then picks back up as we post all the on-demand content, follow-up blogs, recap site, etc. As far as the specific content referenced in the opening keynote, I’m seeing actually a very slight decline (4 unique page views fewer than the day before) on the day of the keynote, a deep valley over the weekend, and as of today (5/17), about a 50% uptick in unique page views over the average. From a content perspective, Pulse is a beautiful thing because it gives us a ton of really rich content and collaborations teed up for the rest of the year. As a former journalist, Milton Herman loves a good story. He's a former content strategist, writer and Slack evangelist. He's passionate about sports, travel and learning. Follow him on Twitter.